Used, consigned and discontinued gear is now available on our Backwater Angler EBAY page. If you are lucky bidder some of this great stuff could be yours at the end of the 7 day or 10 day auctions. Everything listed is a Backwater Angler E-Bay exclusive and will not be sold out of the shop. Shipping Costs are a fair $15 for USPS Priority Mail. Happy bidding! This entry was posted in gear, news, Shop Online on March 5, 2018 by Theaux Le Gardeur. Shopping for anglers for the holidays can be tough, but many products we stock make useful gifts no matter how knowledgeable, skilled or well stocked an angler may be. We constantly test new products from some of the biggest companies in fly fishing every year, and also get angler’s opinions on favorite products and top wish list items. #10 Airflo Ridgeline Tactical Trout Fly Line– Fly lines often get overlooked by anglers, yet a great line can help with casting and improve fish catching numbers. This line has a five year no crack guarantee and its “ridged” design and slickness means added distance and quicker load time for all rods. A perfect gift especially for angler’s who own numerous rods and reels that may need a new line somewhere in the arsenal. #9-Hareline Fly Tyers Grab Bag– Fly tyers tend to accumulate a lot of materials over time, although few tyers get really good products that have multiple uses. As a fly tyer and guide I constantly search for and discover great materials to create unique flies. Purchase a personalized and customized materials selection picked out by our guides based on type of fishing the angler enjoys. Mix and match a few different items for a small gift or load up on multiple items for an incredible tying selection. #8-Backwater Angler Gear– Long sleeved shirts featuring brown, rainbow and brook trout with the backwater angler logo on the front will be in stock before the holidays. Wool, oil cloth, supplex, tactel and cotton hats are available in a variety of colors and feature the Backwater Angler logo. #7-Cloudveil Shirts- Cloudveil has two styles that have become popular sellers in the shop. My favorite is the Spinner Inertia Peak Shirt that is totally water repellant, features snap button front and three zippered pockets. The Cool Shirt is lighter for tropical and warmer weather use and wicks away moisture and drys quickly. The Cool Shirt has button down front and three zippered pockets. #6-Bauer Fly Reels– Bauer Mackenzie Superlight reels have been used in the Backwater Angler guide service for years and have proven themselves as durable, reliable reels. A smooth drag, light weight design and sleek look make the Bauer a highly prized reel. #5-Patagonia Deep Wading Jacket– Patagonia’s deep wading jacket is a light weight water-proof jacket with a shorty design. The jacket features two front pockets, adjustable hood and folds down to a easily packable size. It can be worn fishing or around town and has Patagonia’s “iron-clad” guarantee. #4-Patagonia Capilene socks, shirts and pants- Midweight and heavyweight socks aid in keeping feet warm during winter fishing and even cold summer Gunpowder flows. Light to heavy fleece pants and tops provide warmth while wicking sweat away from skin. An extra pair of underlayers is always a good gift idea for anglers who fish frequently, as they can always use a spare pair on multi-day trips. #3-Cloudveil 8X Waders and Wading Pants– Cloudveil’s 8X waders are the ultimate gift idea for the serious angler. The 8x waders feature chest high design with three waterproof zippered pockets, built in gravel guards and five layer Gore immersion fabric, and XCR upper fabric which is more breathable than previous wader fabrics. The Wading Pant is a wader created to fit like a regular pair of pants, which allows more comfort for anglers fishing smaller rivers and streams. The waders feature front and back zippered pockets, built in gravel guards, suspenders and a front zippered fly. #2-Loaded Fly Box- The C & F fly box features slotted foam, a leaf insert design and is sized to fit into any pockets or pack. No matter how many years angler’s fish they can always use flies, as many end up in trees or large trout. Let our Gunpowder River guides choose one of these boxes and load a selection of Gunpowder producers for a gift that keeps on giving. We can make a selection however big or small, but this box can hold 564 flies at two dollars each, so watch out! #1-Bamboo Fly Rod– Many anglers dream of laying out tight loops on a hand crafted piece of working art made by an expert craftsman. We have a selection of various rods built by Maryland and Pennsylvania anglers, who are recognized as local bamboo craftsman. We also have access to rods built by the larger companies such as Scott, Eden Cane and Sweet Grass Fly Rods. 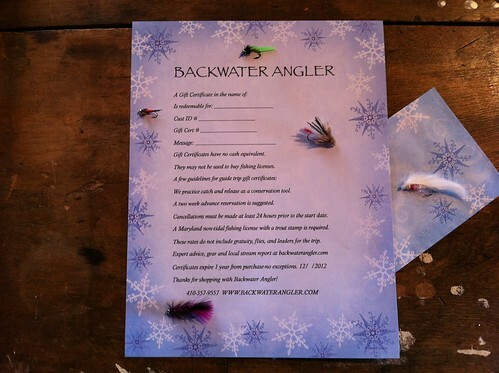 Backwater Angler Gift certificates are great choices and can be chosen in any dollar amount and may be redeemed for guide trips, casting lessons, clinics, gear or even flies. Gift certificates allow family and friends to buy for anglers who are difficult to buy for and leave endless options for the angler receiving the gift. 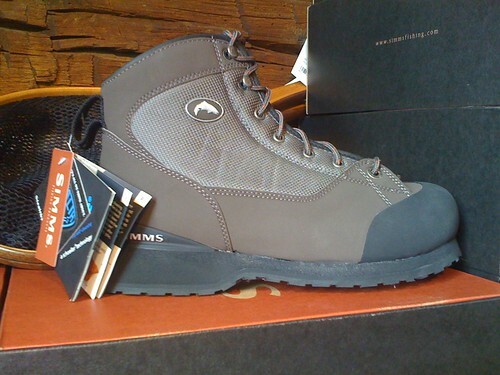 This entry was posted in gear, reviews, Shop Online on November 25, 2007 by Jason du Pont.